-Is Tom Cruise secretly dating fellow Scientologist Laura Prepon? This makes me weirdly bummed out. 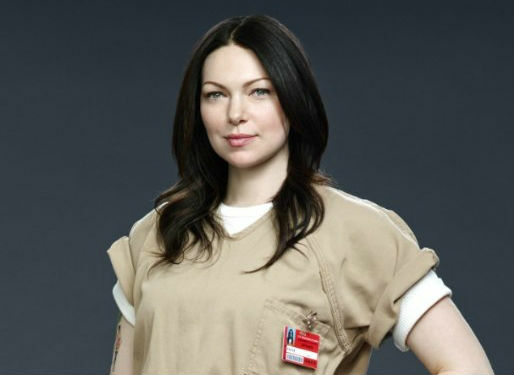 -In happier Laura Prepon news, The Orange Is the New Black season two trailer has arrived! -This makes me wonder why I don’t follow Val Kilmer on Twitter. -19 months after announcing their split, Will Arnett has filed for divorce from Amy Poehler. And now our pain begins anew! -Speaking of Parks and Rec stars, Ben‘s Letters to Cleo shirt AND his Catan-esque game will both make an appearance in the season finale. Score! -Judging by these new photos, Adam will be sticking around in the next season of Girls. Thank goodness; he and Ray are pretty much the only interesting people left on that show. –Miley Cyrus is really bummed about her hospitalization, guys. -It looks like Anna Paquin will make it into X-Men: Days Of Future Past after all. -Speaking of X-Men: Days Of Future Past, director Bryan Singer has been accused of sexually abusing 17-year-old boy. (His lawyer says the lawsuit is “completely without merit.”) Does this mean we shouldn’t go see the movie? Because I have a really hard time staying away from anything that involves James McAvoy. –Gwyneth Paltrow (who once said she’d rather die than let her kids eat Cup-of-Soup), served tacos and hot dogs topped with Fritos at her son’s birthday party. Gasp! -Meanwhile, Gwyneth and the CEO of GOOP have consciously uncoupled. -The Good Wife’s Emmy campaign has gone negative. Love the show, hate this strategy. –Harvey Weinstein and Scott Rudin‘s former underlinings talk about who was worse to work for. They both seem kind of horrible. -The Cannes lineup has been announced and there are a few great surprises (Ryan Gosling‘s directorial debut! Lots of Canadians!) and a few not-so-great ones (like the lack of Angelina Jolie’s Maleficent). -There’s more trouble for Columbus Short (who plays Harrison on Scandal). His wife has filed for divorce, claiming he threatened to kill her and then commit suicide. -This Scandal Monologue Mad Libs is perfection. -Speaking of perfection, here’s the honest trailer for The Wolf of Wall Street. –Robert Pattinson and Guy Pearce face a grim future in trailer for The Rover.